Air pollution isn’t limited to car exhaust, jet fuel, sprayed pesticides and factory smoke. Mold spores, pollen, pet dander, dust mites and smoke can be trapped inside your home or office, which can increase your allergies and asthma symptoms. Generally speaking, all air purifiers have an intake where the air is taken into the system to be filtered and another spot where it’s released after filtration. Before we get into our best picks, we wanted to explain a little more of the technical side of how they work and what to look for when picking out the right air purifier for you. High-efficiency particulate air filters (aka HEPA filters) force air through a mesh screen and collect harmful particles like mold spores, pollen and dust mites. Many air purifiers use HEPA filters, and we’ve noted in our reviews which product has a true HEPA filter and which does not. We discuss 3 certifications in this article: Clean Air Delivery Rate (CADR), Energy Star and the Association of Home Appliance Manufacturers (AHAM). CADR is a measurement of how fast an air purifier delivers filtered air. The higher the CADR, the better. The U.S. Environmental Protection Agency (EPA) gives products the Energy Star rating when they meet energy-efficient guidelines. AHAM is an organization that inspects the performance of household appliances. Note: Not all of the products listed below will have all 3 of these ratings. We provided information about these certifications for the products we could find. You’ll hear us refer to microns in this article and the size of microns an air purifier can handle. A micron is equal to one-millionth of a meter (aka it’s super small). To give you some perspective, here are some common particles in our air and their size in microns. Note: If you want your air purifier to get rid of smoke, you’ll need one that can filter particles as small as 1 micron. If you want an air purifier to help with pet odor and dander, you’ll need one that can handle particles as small as 5 microns. Ahhhhh, now you can stop holding your breath as it’s the moment you’ve been waiting for: our recommendations for the best air purifier. Note: While conducting our research for this article, we noticed some users complaining about the release of cool air from air purifiers. To clarify, this is totally normal, and it’s natural for there to be a slight breeze. This advanced air purifier uses a 4-stage filtration system (pre-filter, deodorization filter, true HEPA filter and vital ion) that captures up to 99.97% of particles (0.3 microns) in the air. It’s amazingly effective in reducing odor, pollen, pollutants and many other allergens. We think it’s the best air purifier for allergies. Its real-time pollution sensor lets you know how clean or dirty your indoor air is all day long. You can set the timer to turn off after 1, 4 or 8 hours. And to save energy, this purifier will automatically stop the fan and go into Eco mode when no pollution is detected for 30 minutes. This Coway purifier is designed to accommodate room sizes up to 361 square feet and is ideal for apartments, a great room and other mid-sized spaces. Many users, however, report excellent performance in much larger spaces. The GermGuardian AC4825 is a high performer at a reasonable price. This air purifier claims to capture 99.97% of dust and allergens (as small as 0.3 microns) including pet dander, mold spores and plant pollens. It has UV-C light technology, which kills bacteria, viruses (including rhinovirus, e.coli and streptococcus), germs and mold spores in the air. The charcoal filter reduces cooking, smoking and pet odors, and the HEPA air filtration system helps reduce exposure to asthma triggers. This #1 bestseller on Amazon is great for medium-sized rooms, and users rave about it being the best air purifier for pets. Is the Molekule the next gen of air purifiers? That’s what they claim — and consumer feedback seems to agree that this new technology’s ability to clean the air is more effective than traditional HEPA-filtered purifiers. Molekule’s major selling point is PECO, an innovative nanotechnology that utilizes free radicals to oxidize pollutants and kill airborne viruses and airborne chemicals (called VOCs). They say that this technology can destroy pollutants 1,000 times smaller than traditional HEPA filters. Molekule has also gotten some impressive nods — a silver award as a “Best New Product” by Edison Awards, one of Time’s “Best New Inventions” in 2017 and Popular Science’s “10 Greatest Home Inventions of the Year.” The only major downside we see for this product is its high price tag, which will turn away some consumers. They do, however, offer a 60-day money back guarantee. Molekule gives you one year of free filters and offers a 60-day money back guarantee. Want cleaner air wherever you go? The Pure Company Portable Air Purifier is a perfect solution for hotel rooms, your office or any small room in your home. This unique product even won a 2019 Consumer Electronics Show Innovation Honoree Award. This portable purifier uses filter-less ionization technology to clean the air. All you need is an AC outlet to use it, and it requires no maintenance. It also comes with a bottom-loading aromatherapy pad that’s compatible with The Pure Company’s 100% essential oils. If you want a sleek and modern air purifier, look no further. 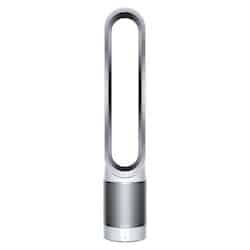 The Dyson Pure Cool Link Air Purifier claims to remove 99.97% of allergens and pollutants as small as 0.3 microns. The Dyson has an app that includes information about the filter’s life, acts as a remote control and lets you schedule when the purifier is on and off. It also has a night mode, which is quieter and dims the display. The main reason this didn’t make our top three is because of its high price point (without the technological advances you’ll find in the Molekule). You can get other HEPA air purifiers for much less, and they do just as good of a job as this Dyson does. Unless you want an air purifier with an app, we recommend looking at our top three. Want An Inside Look At The Dyson Air Purifier? Check out this video to see how techy this air purifier truly is. If you’re looking for a less expensive option to use in a 10′ x 11′ room, then the Holmes HAP242-NUC air purifier is a great choice. It claims to remove up to 99% of airborne particles as small as 2 microns. You can place the purifier vertically or horizontally on a desk, table or other surfaces. As stated, it works best for smaller rooms, approximately 110 square feet, so using this in an office or bedroom is ideal. This Holmes air purifier has a carbon filter which helps remove up to 44% of odors from the air. Honeywell is a household name making security equipment, HVAC equipment, doorbells and air quality equipment including air purifiers. The glass fiber HEPA filter collects up to 99.97% of particles as small as 0.3 microns. The system will notify you when you need to change or clean the filter. The pre-filter, which is carbon activated, captures larger particles and reduces odors and should be replaced every three months. However, if you vacuum the pre-filter, it can be extended to 3-5 years. Here are two other possible solutions to get rid of unwanted indoor air pollutants. Every furnace has an air filter that needs replacing regularly. Depending on the type of air filter you get will determine how often you need to change the filter. For example, the filters we use at our home last for three months. Put a reminder on your calendar to check your filter to help keep your furnace running smoothly. How often should you change your home’s HVAC filters? For basic 1″-3″ air filters, most manufacturers recommend that you replace them every 30-60 days. But if you suffer from allergies or have multiple pets in your home, you might want to upgrade your air filters or change them more often. If you don’t want to have an air purifier in every room, you can install a whole home air purifier solution. These air purifiers can be in the thousand dollar range, so they aren’t as inexpensive as the air purifiers we reviewed for this article. It’s an investment, for sure, but if you want a house full of clean air, a whole home solution may be best for you. According to Forbes, we spend 90% of our time indoors. Which is frightening since the air quality is also often worse inside than it is outside. An air purifier can clean your air to give you a breath of fresh air inside your home that’s greatly appreciated. But why stop at air? There are other ways you can improve the quality of your home’s health including installing a water filter to have fresh, healthy spring water to drink and an organic mattress so you can have a good night’s sleep. Do you think a high-quality air purifier is worth the higher price tag? It’s too difficult to select a unit between these branded air purifiers. Well, I would like to prefer f=germ guardian and Honeywell air purifier.